Hi friends! Ashley here today with some more love for Take a Hike! My family went to a local "castle festival"- complete with jousting, juggling, music, and medieval food! It also included a trip to the top of Manderscheid Castle, the first castle my son has ever been to. I decided Take a Hike would be perfect to document our "castle climb". I used various little bits, like the explore bingo card and adventure flash card sticker, tucking them behind my photos for just a bit more depth. I also added a stamped sentiment ("you are here") and foot print sticker to create an embellishment cluster. I don't usually stamp on my pages for one simple reason- I'm afraid of messing up! However, I've learned a few tips to really help me break the stamps out more often. First, I try to only buy clear stamps. This lets me test drive its positioning on the page before I ever ink it up. I can just lay the stamp where I think I may want it, adjust it here and there and even change my mind without fear of having to redo anything. Second, I always test stamp before it goes to the page. This ensures that you'll get a clear impression and that your ink pad isn't drying up in places. Thanks for dropping by Simple Stories today- enjoy your three day weekend! Happy Holidays! Wait... it's still August, right? If you're one of those who are counting down the days, you know that Christmas is literally just around the corner! Have you got a head start on your Handmade Holiday cards yet? You probably need a neat place to store them, right? Check this out! I have altered an old "recipe box" that I had laying around. I'm not much for writing down and storing recipes (it's kind of an out of date thing to do now that we have Pinterest! ), so I decided to turn my box into something useful. Of coarse I jazzed the box up with some beautiful papers from the new Handmade Holiday collection and added some ribbons and pearls as well. This is such a simple project to re-create! I hope I have inspired you all to dig out those old boxes and alter them for a neat little decor piece that doubles for card storage this holiday season! I'm totally in love with the Take a Hike collection. In Colorado we play outside a lot and this collection really speaks to me. The colors are perfect for Fall in Colorado when the Aspen leaves change colors. The deep grain wood patterned paper is one of my very favorite in this collection and of course the retro color scheme is such a great palette to work with and makes this picture of my son really stand out. I added some bright orange floss stitched across the top of the footprint paper. I also love how you can easily mix the Expressions Cardstock stickers between collections. This alphabet is actually from the Summer Fresh collection. I also mixed some of the stickers from the Year.O.Graphy collection to add more layers to the page, pop dots are a great way to make them stand out. Love how these small printer's trays make a quick project. This one was was easy to put together with just pattered paper and cardstock stickers and some twine and jewel stickers for good measure. It's great fun to take the Expressions sentiments and make them into little flags. I really love to use the flat sandwich picks rather than small toothpicks (makes it a lot easier to stick to...). It's also fun to use the 4 x 6 Journal Elements to make a little mini album. This one was very easy to put together. I just punched holes in the top left corner, added a binder ring and some ribbon and twine. Voila, instant album ready to add pictures to and because the journal elements are already "decorated," this project only requires minimal embellishment. This was such a great 4 x 6 journal element, because I was able to use the cardstock sticker sentiments and tiny type to fill in the blanks for the message. This is my son and I enjoying the apsen grove we stopped at for lunch. Please come see my blog My Little Sketch Blook for the rest of the details on this mini album. Hi all! Kay here, sharing a few layouts I made with the Harvest Lane Collection. I love fall, and this line makes me SO HAPPY!!! Then I did another fall page and used my Silhouette Cameo to make the white background mat for the photo and title.I then used the 6x6 paper pad to back the title. and then to add a subtle sparkle, I misted them with Mister Huey's Shine. Which was admittedly, a bit difficult to photograph. I suppose you will just have to trust me when I say it is very pretty! I also layered the larger snowflakes with smaller ones, and used foam adhesive to add dimension to the page. Likewise, I used foam adhesive to attach part of my title to the page. I use one very simple sans serif font combined with a script font to create a more playful title. I absolutely adore all of the various bits of pieces of this Christmas collection. The papers can be used as is, or you can use the design elements as starting points for your own creations, as I did here. Truly so much to love about Simple Stories! Thank you for stopping by today! What is your favorite part of Handmade Holiday? Hi All! It's been a while since I've posted as I've been on the move, literally. I recently left the home (in which I've lived for 19 years and in which I raised my children) for a new adventure in the cool pines of northern Arizona. All this was happening during our release of Simple Stories fantastic new lines during CHA in July, and it means that much of my life remains in boxes. So, when I'm short on time, space, and opportunity, I need to grab some easy inspiration and go. The moment I saw the rich fall colors of Harvest Lane, I knew it was finally time to use this inspiration to my advantage. Seriously, can't you just see the two together? 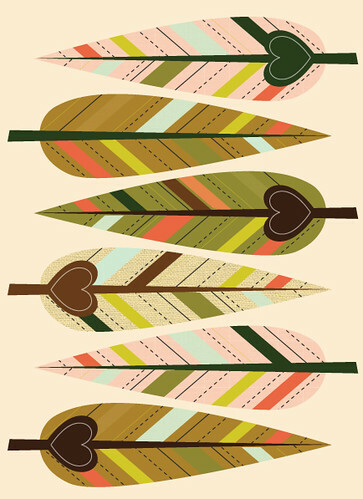 I went straight to my Thanksgiving photos, grabbed the beauatiful papers and voila, I came up with my own version of the pieced together feathers as a simple, but trendy embellishment. So as school starts up, and the weather turns crisper, go gravitate to those warm, rich papers of our Harvest Lane line and create a cozy layout today! We've got some SN@PPY winners! Yep today is the day and we have two lucky winners! Thank you so much to all of you who shared our "Its a Snappy Life" video! We are so excited to bring you a new bright and bold look, combined with a simplified approach and easier-than-ever system to capture all those BITS and PIECES of your colorful life! Tracey Gordon I shared!! I cannot wait to get my hands on these products!! Congratulations ladies please email your information to sales@simplestories.com to recieve your SN@P! goodies!! Take a Hike -- Not just for Hiking! The woodgrain paper and pocket are my favs and I will be using them again and again. The pocket was perfect for a journaling card. And how perfect is the little compass for butterflies finding their way in the world? So, Take a Hike also works as a general travel collection. I LOVE when a collection is versatile enough to be used for so many different themes! Hi all, it's Kellie here and today I have an altered project to show you. For my project today I used the beautiful fall collection Harvest Lane. The colors of this paper line are awesome, and made me want to make a fall project and whats better in the fall than... Pie! The little pie on the Fundamental Cardstock Stickers helped to inspire me to make this crazy project! These stickers are so cute! I think this project will make a great start to a fall centerpiece for my table. 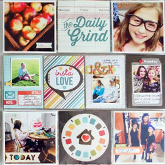 Be sure to check out the new Harvest Lane paper I know you will fall in love with it too! Hi everyone! Ashley here today with a few cards made with Take a Hike. My family doesn't get to do a lot of camping like we used to, now that we live overseas. But, when I got the Take a Hike line, I knew it wasn't just for hiking and camping and I used that as a starting point to create these cards. The first thing that drew me in was the multi-colored stripe paper (Adventure #2508) and the yellow stripe (The Great Outdoors #2506). They just scream 'little boy' to me, so I started by creating a birthday card. I used a Take a Hike Sn@p! Pocket to create an easy focal point. By adding a simple sentiment inside, it makes the card interactive and also creates a great way to tuck in some money or a gift card. I decided a shaped card would be perfect, and matched the patterns and colors of the sticker to build my own tent. I started with a 6x6" card base and cut out the basic shape. Then I cut down the center for the opening in the tent and used a pencil to help me roll the sides up. I secured each of the sides to the bottom corners of the card using jute and then added a focal point with a sentiment from the 6x6 paper pad. This would make a cute invitation to a backyard sleepover! And there you have it, just a few more uses for Take a Hike!